POWELL, Wyo. — Heart Mountain Interpretive Center will present this year’s LaDonna Zall Compassionate Witness Award to Jeff MacIntyre and David Ono in July at the 2018 Heart Mountain Pilgrimage in Powell, Wyo. Ono is an award-winning anchor for ABC7 in Los Angeles who has witnessed history worldwide, covering a variety of current events and chronicling the brave acts of a Nisei soldier across Europe during the war. 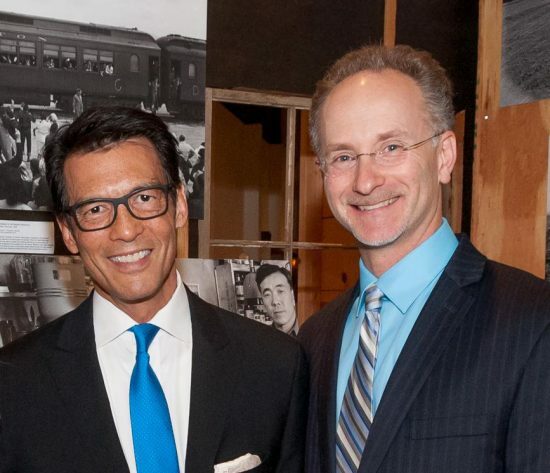 MacIntyre’s company, Content Media, has produced multiple films highlighting the human experience of war, including Japanese American incarceration, the Holocaust, and the Vietnam War. The LaDonna Zall Compassionate Witness Award honors those who have helped the Japanese American community even though they are not directly impacted by oppression. Created in 2017, the award first honored LaDonna Zall herself, who continues to be an acting curator, volunteer, and supporter of the Heart Mountain Wyoming Foundation, aiding in its establishment and growth over the past two decades. Zall was also instrumental in the development of the former confinement site into a National Historic Landmark and the creation of the onsite museum, the Heart Mountain Interpretive Center. The award will be presented on the last weekend of July at this year’s Heart Mountain Pilgrimage to the dual recipients. The 2018 pilgrimage theme focuses on art in any form, created in the confinement sites as well as about the Japanese American incarceration experience. MacIntyre will present an educational session at the pilgrimage, while also reprising his annual role of mentoring as he leads the Digital Storytelling Workshop, which will precede the weekend of events.